Moist to wet places, including fens, swamps, streamsides, borders of marshes, meadows, rock crevices, gravelly and rocky shores; a pronounced calciphile, often seen in interdunal hollows with Primula mistassinica, on moist limestone flats, and in similar habitats. 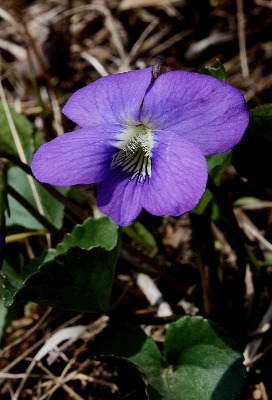 The large deep violet flowers are held well above the leaves. The blades are often only subcordate or nearly truncate at the base. In addition to the blunter, wider leaves and obtuse sepals with small auricles, this may be distinguished from V. cucullata, which may also occur in similar habitats, by the usually bearded spurred petal. Plants with white flowers have been named f. albinea Farw. MICHIGAN FLORA ONLINE. A. A. Reznicek, E. G. Voss, & B. S. Walters. February 2011. University of Michigan. Web. April 19, 2019. https://michiganflora.net/species.aspx?id=2786.